No one wants their child to be bullied. It is something that would break our hearts. But I think that even more so, we don’t want our child to be the bully. At least I feel that way. Luckily, I don’t think it has to be an either/or situation. Along the same lines, no one feels happiness inside when their little angel is aggressive toward another child. Sometimes, acts of aggression come out on a rare occasion. Your child might have been hit by another child and she is reacting to it or maybe it is an extenuating circumstance that really pushed her over the edge. Today we are talking about consistent aggression and what to do about it. This information is found in Parenting the Strong-Willed Child . 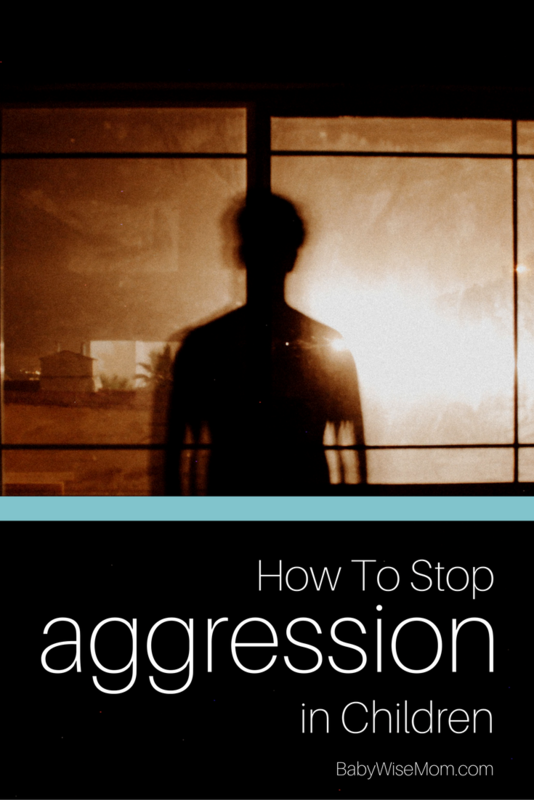 I will say, however, that there are strategies here that I apply even if my typically non-aggressive child shows aggression. Praise Good Behavior: This works on any child for anything. Accentuate the positive. Find Alternatives: Help your child to find other things to do if the child is upset–something other than being aggressive. You don’t want your child hitting other people or animals. Limit Television: I think anyone with any observation ability will admit that the more television is watched (or video games played) the more aggressive the child’s behavior will get. If you have an aggressive child, I would do 0-30 minutes a day. Brayden is far from aggressive. He has been the child to be hit and never hit back. But one day, he got aggressive just in his demeanor. I immediately cut all TV, video games, computer time, etc. for a full week. It is the first thing to go. And it does help with all behavior issues. Limit Time with Aggressive Children: If your child spends a lot of time with other aggressive children, she will be more aggressive. If she is picking up bad habits or if she is tending to be aggressive, limit her time with aggressive kids. Keep it infrequent and for short periods. Also, keep a close eye on the children while they play. As your child gets older (beyond three), she can start to self-manage even in the face of peers doing what they shouldn’t, but up to that point, her morals are not developed and she needs you to carefully guard her exposure. Even after age three, you will have to be careful. Slowly over time, your child will be able to do what is right even when peers don’t. Don’t Reward: Don’t reward aggressive behavior. Did your child hit another child because he wanted that dump truck? You had better be sure your child does not get to play with the dump truck if you want to curb aggressive behavior. Did she hit you because you said no cookie? Don’t give her the cookie! Remain Calm: This is important even if the child was aggressive toward another child. You can be firm, but still be calm. Remember that remaining calm ensures the child doesn’t redirect anger and frustration over consequences at you. He owns up to his own decisions. Immediate Time Out: There are no second chances here. You give an immediate time out. I would look at this a a cooling off period–a chance for your child to take a break and gain composure. I have a 22 month old daughter. She is our only child right now with plans for one more. We attend a play group with children close to her age. She is the only one there without a sibling. It seems that she is the one being pushed and having toys snatched away from her. She does not hit back, but just allows the toy to be taken or offers it to the other child. Almost every time this happens, the parent's apology/response has something to do with an older sibling. "Her older sibling picks on her. She's territorial right now." etc. I don't know what it's like to have 2 children, but it doesn't make sense to allow them to be aggressive at home and then expect polite behavior around others. Is there something about having 2 children that makes the younger more aggressive and territorial, or is this just an excuse? My daughter takes it all in stride, but I don't like seeing her be pushed around. dyhale,I would say that is an excuse. My two girls share very well. They both share much better than Brayden did. I would guess those parents allow the younger child to take things and don't allow the older siblings to do anything about it–the "baby" of the family getting spoiled. I have a 22 month old daughter that is an only child. When we have family gatherings she is repeatingly pushing down her 12 month old cousins. This has been going on for at least 4 months now…increasing more as she ages. I put her in time out & she apologizes & gives them a hug after an incidences but it doesn't seem to be helping. She also pushes, pulls, hits her friend that is a boy exactly one week older than her. My husband thinks she is an extreme bully & I'm not sure what to do now. The Dunnams, I would stay right by her as she plays and when she pushes or hits, immediately remove her from playing and not allow her to play with them for an extended period of time (whatever you think would work for her). As she gets used to the rules of playing with others, you should be able to let her play without you right there. I have a 9 month old boy that started hitting us, whenever he is frustrated, or sometimes when we say no to him. We are not sure how to deal with this. Any advices to deal with him in such a young age? We keep saying no and discouraging this kind of behavior. Sometimes we know why he is frustrated, and it is easier to address it, without giving in, but sometimes it is just out of nowhere. I noticed that he gets more aggressive when he is teething. Toomuchinfo, I would be a big reason is a lack of verbal skills. He can think way more than he can verbalize. Sometimes it is easier to hit than to try oand is talk. Try teaching some sign language. But you want to be sure to stop the behavior. I would say, that's a no. It isn't nice to hit. You will have a timeout since you decided to hit. "Then do a 1-2 minute timeout. Keep that up so he can realize hitting really isn't okay.